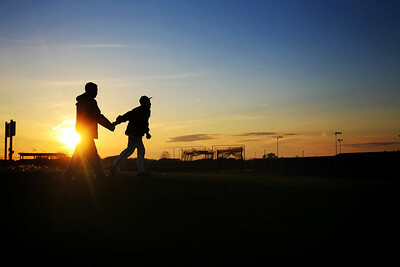 Daniel J. Murphy - dmurphy@shawmedia.com Huntley midfielder McKenna Moffett jumps on the sideline to stay warm before entering the game Thursday April 26, 2012 at Huntley High School. Huntley defeated Jacobs in a shootout. 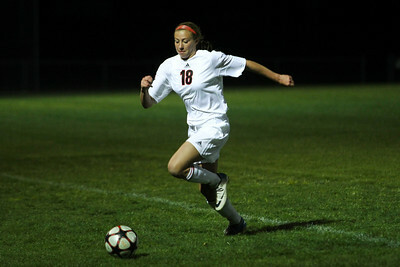 Daniel J. Murphy - dmurphy@shawmedia.com Huntley midfielder Beth Parks goes after a ball in overtime Thursday April 26, 2012 at Huntley High School. Huntley defeated Jacobs in a shootout. 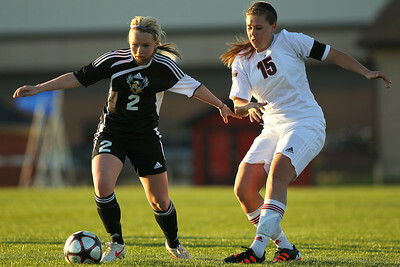 Daniel J. Murphy - dmurphy@shawmedia.com Huntley midfielder Delaney Loprieno (left) and Jacobs' Kelly Grady chase down the ball in the first half Thursday April 26, 2012 at Huntley High School. Huntley defeated Jacobs in a shootout. 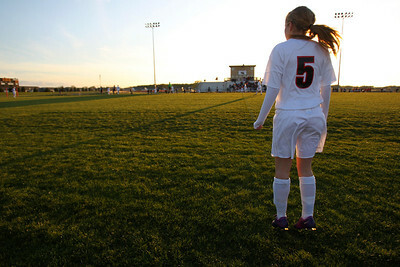 Daniel J. Murphy - dmurphy@shawmedia.com Brian Dennison of Carpentersville helps Maggie Henson, 17, of Algonquin wrap up at halftime of the Huntley-Jacobs girls soccer game Thursday April 26, 2012 at Huntley High School. Huntley defeated Jacobs in a shootout. 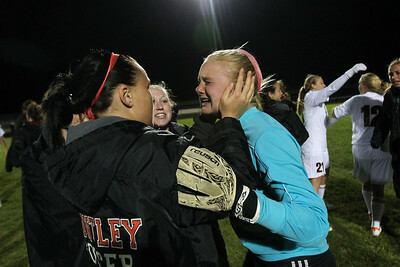 Daniel J. Murphy - dmurphy@shawmedia.com Huntley players embrace goalkeeper Jessica Galason after defeating Jacobs in a shootout Thursday April 26, 2012 at Huntley High School. Daniel J. Murphy - dmurphy@shawmedia.com The Huntley girls soccer team celebrates a win over Jacobs in overtime Thursday April 26, 2012 at Huntley High School. 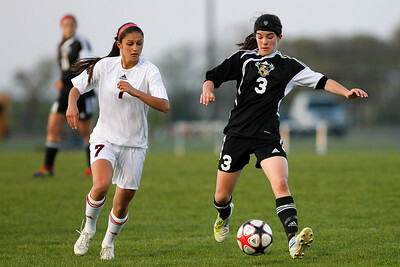 Daniel J. Murphy - dmurphy@shawmedia.com Jacobs' Margaret Rivera #11 kicks the ball downfield against Huntley Thursday April 26, 2012 at Huntley High School. Huntley defeated Jacobs in a shootout. 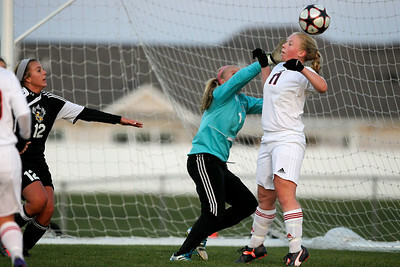 Daniel J. Murphy - dmurphy@shawmedia.com Huntley goalkeeper Jessica Galason (center) deflects a shot on goal in the first half Thursday April 26, 2012 at Huntley High School. Huntley defeated Jacobs in a shootout. Daniel J. Murphy - dmurphy@shawmedia.com Kids play catch at halftime of the Huntley-Jacobs girls soccer game Thursday April 26, 2012 at Huntley High School. Huntley defeated Jacobs in a shootout. Daniel J. Murphy - dmurphy@shawmedia.com Jacobs' Kylie Dennison (left) and Huntley defender Rachel Zobott (right) fight for the ball in the first half Thursday April 26, 2012 at Huntley High School. Huntley defeated Jacobs in a shootout. 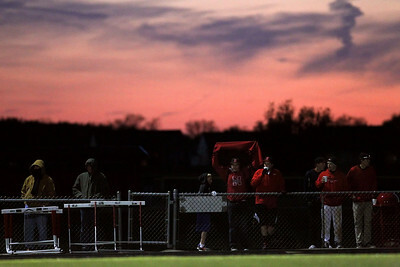 Daniel J. Murphy - dmurphy@shawmedia.com Onlookers watch the Huntley-Jacobs girls soccer game as it enters overtime Thursday April 26, 2012 at Huntley High School. Huntley defeated Jacobs in a shootout. 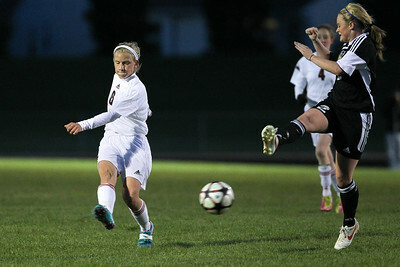 Daniel J. Murphy - dmurphy@shawmedia.com Huntley defender Abigail Nordeen kicks the all past Jacobs' Kylie Dennison in the second half Thursday April 26, 2012 at Huntley High School. Huntley defeated Jacobs in a shootout. 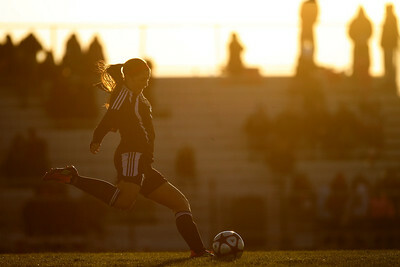 Brian Dennison of Carpentersville helps Maggie Henson, 17, of Algonquin wrap up at halftime of the Huntley-Jacobs girls soccer game Thursday April 26, 2012 at Huntley High School. 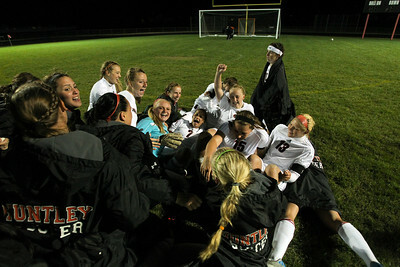 Huntley defeated Jacobs in a shootout.